More than 700 million people around the world do not have access to clean drinking water. For residents of Dhaka, Bangladesh, this is because sewage seeps into the city’s old, cracked pipes that transport their drinking water. The invasion of sewage into the water means that waterborne diseases spread easily, sickening many people. Without overhauling the city’s water transportation infrastructure, how could residents have access to safe water? By cleaning it where it’s collected–at the communal hand pumps. The new, media-rich e-book from QUEST, Engineering Is Cleaning Poop from Drinking Water, tells the story of how a team of scientists and engineers at Stanford University designed an inexpensive water purification device that attaches to the water pumps used by people in Dhaka. The device dispenses chlorine in just the right amount, killing microbes and making the water safe to drink. The book explains the team’s process of researching solutions, designing the device, testing it and making improvements (using a 3D printer!). The book also contains a career spotlight video of Amy Pickering, the lead engineer on the project. And, there’s a look at the various ways water treatment plants in the United States treat water so that it’s safe for us to drink. 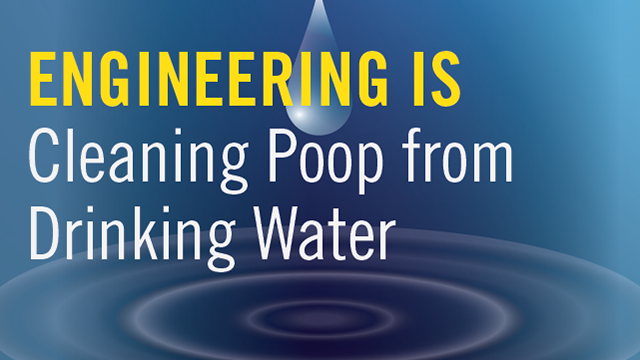 Engineering Is Cleaning Poop from Drinking Water is the fourth e-book in our Engineering Is… series and is available to view on your computer, tablet and smartphone, for free. You can find links to all of KQED’s e-books at kqed.org/ebooks. Learn how a 3D-printed device made it possible for people in Dhaka, Bangladesh to have access to clean drinking water.